"Too stiff" to practice yoga? My teacher used to say that’s like saying you’re too dirty to take a shower. Just like a shower will clean you, yoga will increase your flexibility. So, how often should you practice to increase your flexibility? The honest answer? It’s different for everybody and every body, but the more yoga you do, the more open you’ll become. I know, you’re probably annoyed with that answer. You probably want something concrete, something tangible, especially if you started practicing yoga to become flexible. But that is the truth! Some people will increase flexibility after four weeks of casual yoga practice. Others will take four years of regimented practice just to reach the toes or connect forehead to knee in Intense Side Stretch. So here are a few words of encouragement, some tips, and a couple of poses that will help even the stiffest of yogis increase flexibility. Flexibility is a journey, not a destination. Similar to a weight loss journey where you focus on losing a pound a week for 10 weeks, focus on the more frequent small wins rather than the ultimate end goal. If you’re struggling to reach the floor in a forward fold, focus first on reaching your ankles. Then, when your body is ready, try to reach the tops of your feet. Then reach for your toes. And eventually, reach for the floor. Break it down to keep yourself motivated, and celebrate the small wins to prevent frustration. Genetics, weather, hydration, gender, physical fitness—these are just some of the host of factors that affect and determine your flexibility. Maybe one day you’re better hydrated and nourished and your muscles open up deeper than they have before. Maybe you roll out your mat the next day expecting the same openness but you didn’t sleep well and you’ve had a stressful day at work. Lo and behold, your hamstrings won't budge. Every day is different. Every day YOU are different. Take each day as it comes and remember: wherever you are is right where you’re meant to be. Flexibility is patient; flexibility is kind. Beautifully put in 1 Corinthians 13:4, "Love is patient; love is kind. It does not envy, it does not boast, it is not proud." We can apply this to our flexibility journey as well. Come from a place of self-love. Be patient with yourself. Be kind to yourself. Do not envy others. Let go of anything that isn’t serving you and focus on the small wins along your flexibility journey. Now that we’ve set the mental and emotional bodies up for success, let’s get physical. This is a great pose to practice daily to increase your flexibility, and measure it as well. 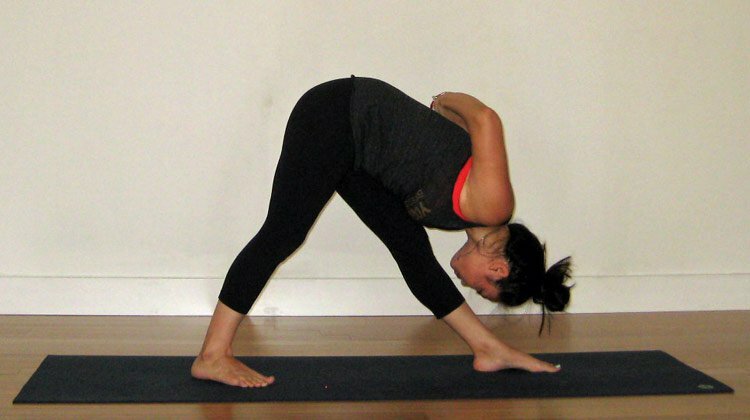 You can also easily modify this pose by simply adjusting the bend in your knees or practicing first with a block. Once you’re comfortable, you can start to send the top thighs back as you ground the heels down. Once you’ve reached your max for today, hold for five breaths. Begin to straighten the bend in the knee and reach toward the Earth with your palms, as your flexibility increases. Low Lunge is a foundation pose for a lot of Vinyasa sequences, and for good reason. It’s a great way to open up the psoas, or hip flexor, which can be incredibly tight thanks to the walking, running, cycling, and sitting we do 18 hours a day. By opening this muscle, you can also relieve a tight low back. It’s all connected in this glorious body of ours! Once you’ve reached your expression of the pose for today, hold for five breaths before switching sides. Another delicious pose that will increase your flexibility when practiced often is Intense Side Stretch. It will increase the flexibility in your shoulders, chest, hips and hamstrings. This pose can also be modified for different levels of flexibility by adjusting how far down you send your chest/torso. Many beginners can reap the benefits simply by hingeing at the hips and extending the chest forward, parallel to the mat and over the extended foot, rather than down. Hold for five breaths and switch sides. While every body is different and everyone’s flexibility journey is unique, it's fairly safe to say that the more you practice—dynamically and passively—the more flexible you’ll become. Keep these mental, emotional and physical tips in mind as you safely and gently explore your body’s unique abilities. We’d love to see your journey progress, so snap a before and after yoga selfie in those splits, or finally getting that nose to knee in your seated forward fold and leave it in the comments below.